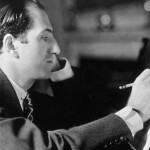 When I was sixteen, I was a Gershwin fanatic. I revisited some of that music today after a thirty-year-plus hiatus. After my previous post on Cage’s Cheap imitation, I have been thinking more about the piece and doing some poking around. Here are some random thoughts about it. 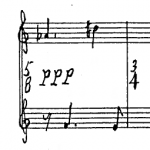 I’ve started working on Morton Feldman’s Palais de mari, and I plan to do a number of posts on this piece as it sinks in. And I’ll start at the beginning, writing about the nature of opening ideas in late Feldman. This Sunday morning’s playlist was a single piece: Cage’s Cheap imitation. I’ve been playing Feldman’s Intermission 6 lately. 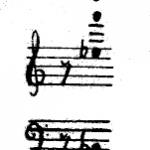 Here’s my take on how to play the piece. 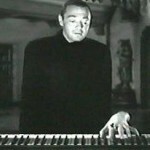 This Sunday’s playlist starts with one of my favorite horror movie piano scores: the Bach-Brahms chaconne. 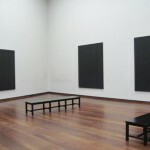 We were in DC and visited the Rothko show at the National Gallery of Art. It’s a must-see. There’s another approach to realizing Two: completely determining everything using chance operations. I tried this out and describe the results. This week’s all-dance freestyle playlist is inspired by Fred & Ginger. Another Sunday morning of sightreading. This week: Feldman, Debussy, Schumann, and Chopin.